What I had here was a story that I wanted very much to enjoy, with a quirk that came a hair’s breadth from causing a DNF in chapter 2. If I *never* see the word “demon” again, that will be just fine. This book has a lifetime’s supply. Yes, Justin has some. So do the other characters. Yes, they need to be vanquished. Doing so with subtlety makes for a good story. These demons are personified, given actions and implied dialogue. As seen from the first person POV of Justin, the whiz-bang skater of all styles and sports, they are a huge distancing effect from the emotions of the story. Yes Justin feels their effects, but they’re outside of him. The effect might have been intended to make his feelings concrete, instead, they become a barrier between him and his ownership of his feelings and reactions. There’s some really good stuff in here, with family coming together, eventually, and in Jack’s case, a little unbelievably, with love and closet-dwelling, with teammates being important beyond the rest of the world and ingrained prejudices, and the slow realization of love with a background of two twenty-year-olds’ assholery, and the physical prowess of the young and highly trained. They almost, but not quite overshadow some absurd plot points, such as Marina the Russian skating coach’s personal plans, CJ’s unbelievable silence in the face of threat, and an entire group of young men’s inability or unwillingness to use basic internet tools. I don't believe for a minute that a team wouldn't try to find out about the newcomer. Justin’s family has been torn apart by the death of his mother. He, his brother, sister, and father all have to come to terms with their reactions to and blaming for her death, and watching them heal is one of the strong points of this story. An extraordinarily gifted child such as Justin can be a disruptive force in the family, and this story doesn’t shy away from exposing the cracks in the unity. The degree of physical dedication to skating at this level was an integral part of the story, but not overwhelming, and made a very rich atmosphere. That CJ is also a highly ranked athlete was great, it gave them balance on the stardom issues. 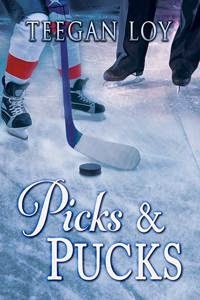 CJ is a hockey star who’s also a whiz in the kitchen, and amazingly well balanced until all of a sudden he needs to be something else, which was a little jarring. Another character, Danny was an interesting study: he was torn between what he wanted and what he thought he could have, what he wanted to do and what he thought he was expected to do, and his arc may not be quite complete. This story left me torn, because there are some excellently done aspects mixed in with the less believable and the outright aggravating. I found enough to like in this book that I read past the Chinese water torture of the demons, but it was a near thing. After the initial chapters, the framework of the personified demons would fade away for a while and I could sink into the story, until Ack! There they are again! Yanking me out of the story and denying the characters ownership of their emotions. This author can write, and I would give her work another try, but this book has enough problems that I can’t rate it more than 2.5 marbles.